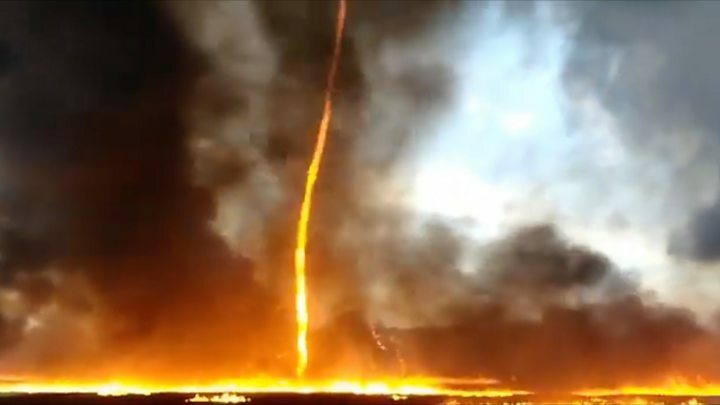 Firefighters have captured the fascinating and mesmerising moment a "firenado" engulfed a plastics factory in Derbyshire - which reached an astonishing height of more than 50ft. A spokesman for Derbyshire Fire and Rescue Service said: "The fire involved approximately 100 metres x 100 metres of stacked plastic pallets". Firefighters were joined by colleagues from other counties as they tried to prevent the fire spreading. The event occurs when cool air enters the top of an area of hot air. This particular "firenado" happened when a plastics factory - which makes bread trays for the whole of the United Kingdom - went up in smoke in Derbyshire near Manchester. The enormous black plume was seen for as far as Nottingham, which is 40 kilometres away. Much like a tornado, the 'firenado, ' or fire whirl, is formed when cool air comes into contact with hot air from above, causing the swirl. Derbyshire's police and fire services have launched a joint investigation.